This is the pattern in mind when I think of Kabini. Undoubtedly the elusive Leopard. The best place in the world to photograph this beautiful cat is around the backwaters of Kabini reservoir at Nagarhole National Park. 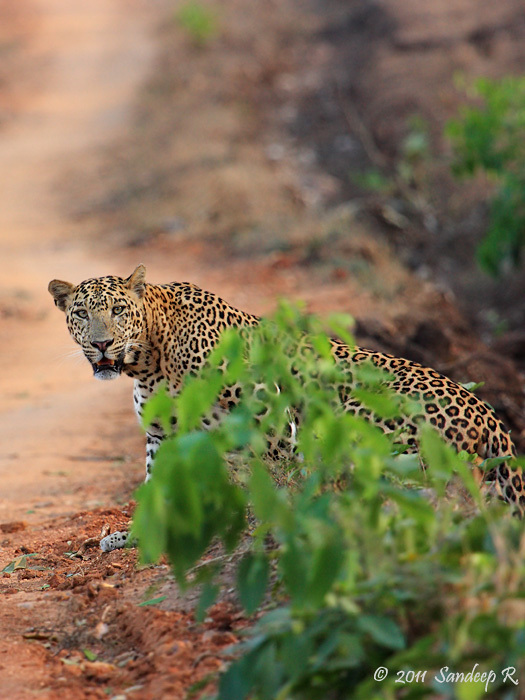 I have never returned from Kabini without sighting this spotted cat (including my last month’s visit). Having visited Kabini many a times, I had missed visiting this magical place in summer for long time. Arun, Selva and Sudhir agreed to join me, and I made a booking more than a month in advance for 2 night stay at the Kabini river lodge. Ooty was an obvious and easy choice for the weekend prior to Kabini visit from April 11 to 13th. Check out the Ooty trip report and few images here. Started from Ooty after photographing few birds, briefs stops for sightings of Black Eagle, Chestnut headed bee eaters and Elephants near Bandipur, we were sightly late to reach Kabini. The expectation was high and Kabini didn’t disappoint. Soon into the evening safari, we saw this huge leopard. It paused for a moment to check us and all our cameras hit non-stop for 3-4 seconds. Combined, we must have captured about 40 frames in 3-4 seconds. The search for the bigger striped cat was on on almost all safaris. 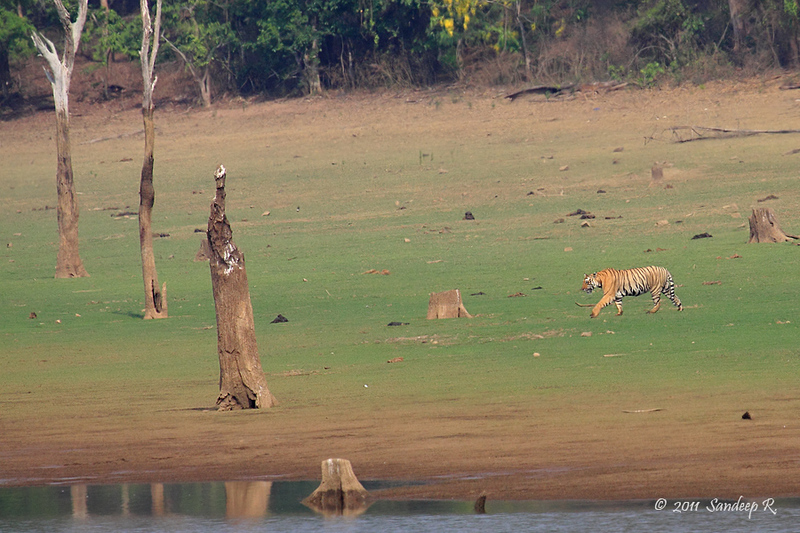 We missed an opportunity on 2nd day morning safari when a tiger arrived at the backwaters to quench thirst. But we did get to sight the big bird, Spot-bellied Eagle owl. Back at the camp, each of us spent time to shoot macros of spiders and other insects. 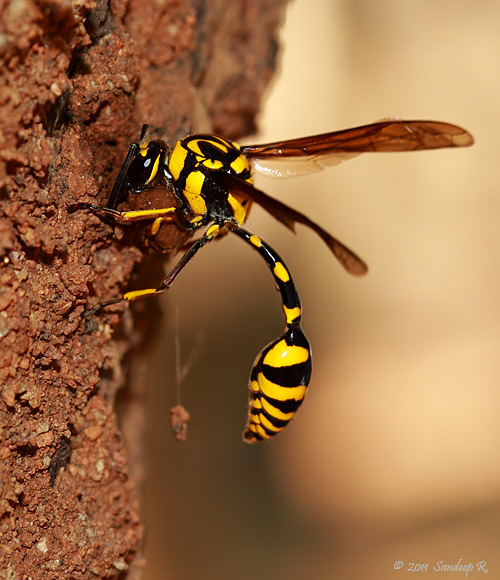 Fearing a nasty sting, I got close to this wasp for only one shot. Evening safari again yielded many elephants. A herd of spotted deer gave fantastic opportunity to capture some silhouette images on the backwaters in the golden light of fading sun. Now, what’s Kabini without elephants. 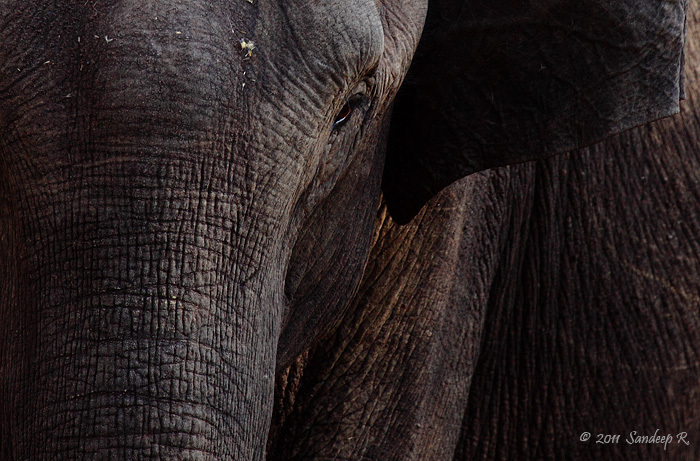 The best part about Kabini in Summer is the congregation of Asiatic elephants. You will find them pretty much everywhere – in the forest, on the backwaters, in the water. There were tons of them. It was a beautiful sight to watch mother with calf, huge tuskers young bulls, on the back waters – bathing, feeding, wrestling. 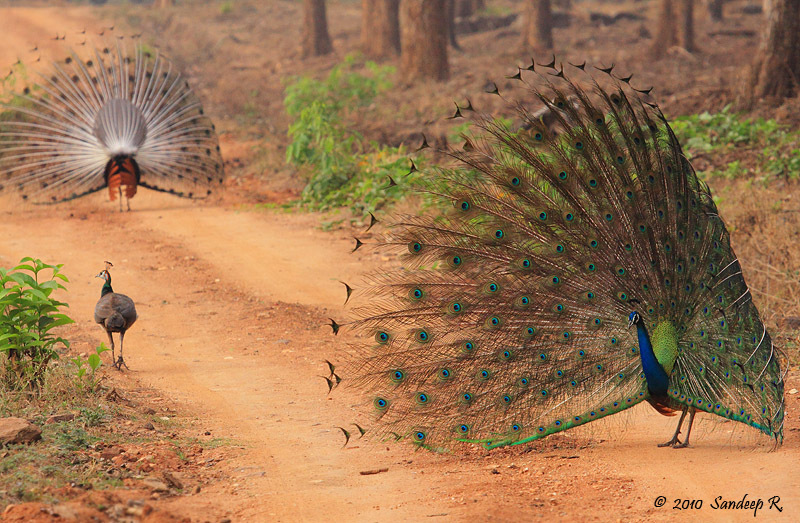 The final morning safari started with a beautiful sight of two peacocks trying to woo a mate. The spectacle was full on right on the jeep track. If not disturbed by the jeep ahead on trying to reach the sunset point from where a tiger was sighted, we would have seen more display of romance of peafowls. Even our jeep was rushed to the sunset point only to hear from the few jeeps that were already there that tiger went back into the thickets. Few jeeps decided to stay back, and our jeep driver decided to get to other part in hope of tracking the big cat. Soon, they get a call saying tiger is seen again near the sun set point. What followed that was something that I had only heard happens (and subtly experienced) in Central Indian forests. All the jeeps that got the info on tiger rushed at inexplicable speed to the spot. It was utter madness as I just sat disappointed, covering my eyes from the huge dust storm the convoy of jeeps had created. Just as we were getting out, a couple of Dholes were sighted. Again, all the jeeps rushed as the were moving slightly ahead. The thunderous noise of the jeeps scared the Dholes and they got inside the bushes. If only we had turned off jeeps and waited, instead of rushing towards them they would have got comfortable and taken the jeep track as they were to do. It was disappointing to see people who know jungle better than us and drive everyday not understand the Dholes’ behavior. We waited for nearly an hour at another spot facing the back waters. Few alarm calls heard, but no sighting of any big predator. We were to wind up the safari and just then got a call from another jeep about the tiger sighting, again at Sun set point. By the time we got there, the tiger again had gone inside the bamboo thickets. But we could see it through binoculars and record some strips of a sleeping cat on our cameras. We waited for few minutes in the false hope that this tiger would get up and provide better views. I was capturing some images of an elephant and calf grazing on the backwaters. Just then one guy in a jeep started yelling ‘Tiger, tiger!’ All thought he was kidding. But he was proved right as all of us pointed our cameras and binocs towards a distant patch of backwaters. A tiger was walking down the path, from the bamboo thickets towards the water. Two tigers in ten minutes! The lighting was perfect and the tiger majestically walked towards water albeit a little wary of more dangerous animals, humans. She was really far for any portrait-esq image. However, the sighting was heartening and marked a good end to a wonderful summer trip.